There is a third series coming in The Walking Dead minimate collection by Diamond Select Toys. This toy series will be focused on the prison that has become well known in season 3 of The Walking Dead. Robert Kirkman, the man behind the comic, will also be judging a video contest using previously released minimate toys. Listed below are some of the cool toys you can check out in series 3 of the minimate collection. Also, besides the announcement of the newest minimate collection, they are offering a video contest using the first two series of the minimates. There is more from the press release below from Skybound Comics. Diamond Select Toys, the leader in toy manufacturing for the comic book specialty market for 2012, andThe Walking Dead creator/writer Robert Kirkman and his Skybound imprint at Image Comics bring youThe Walking Dead Series 3 Minimates coming this Spring, based on Kirkman’s Eisner Award-winning, groundbreaking comic book series and graphic novels. 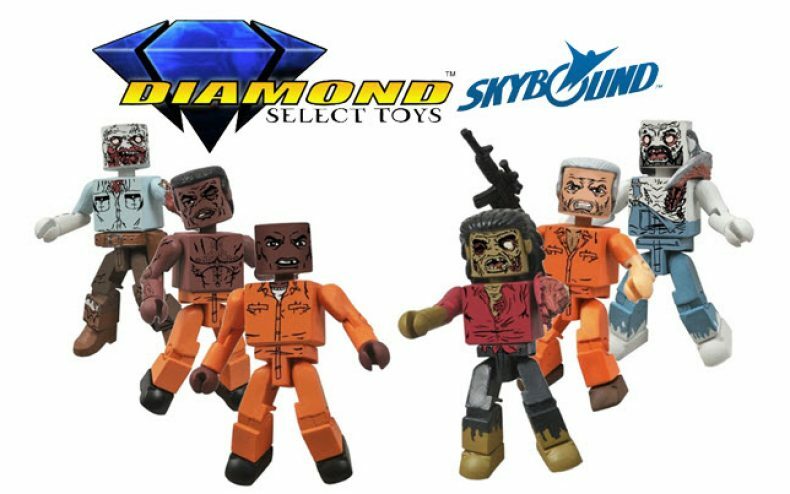 To celebrate, Kirkman and Diamond Select Toys will judge a contest featuring fan videos utilizingThe Walking Dead Minimates toys already available. The videos should tell an original story based on the universe ofThe Walking Dead, the leader in all original graphic novels for 2012.The Walking Dead 100 was the year’s top selling issue of any comic book for 2012. Each video should be no more than 60 seconds in length and the winner will receive a personally autographedThe Walking Dead Compendium and an autographed set ofThe Walking Dead Minimates Series 3 set. All videos will be the property of Skybound and the winning video will run on www.Skybound.com with the winner’s name. The contest will end on February 5th and the results will be announced February 10th on www.Skybound.com.